How do they support the race in Japan? If you weren’t already aware, the Japanese fans are crazily obsessed with Formula One, especially so if there is any connection to the Land of the Rising Sun on the grid. 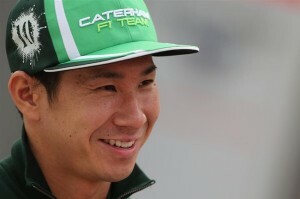 Kamui Kobayashi is the only Japanese driver this year, and got a rapturous reception when he finished third for Sauber in 2012. Aside from him, there are no other Japanese teams, engine providers or drivers, although Jenson Button feels a strong connection with the fans here. His other half is half-Japanese, (and no, that doesn’t make him a quarter Japanese) he did a lot of charity work post-tsunami and earthquake in 2011 and he also drove for the works Honda team from 2003 until they pulled out of the sport at the end of 2008. Talking of which, Honda are returning to F1 in 2015 as engine provider for Mclaren. The two last teamed up in 1992. They were an extremely successful partnership in the late 80’s, with Ayrton Senna being idolised in Japan as he won races with Honda powered cars. This circuit is owned by a subsidiary company of Honda, so expect to see lots of PR here from their side. I’ve read rumours of a gigantic Honda blimp being present before the race in part of a spectacular air show, which I hope will get televised. Post-Honda era, Mclaren welcomed Mercedes into the fold in 1995 and have been with them ever since, winning multiple races and 3 Drivers’ World Championships. The engine supplier has grown and grown in Formula One, also providing power units to Williams and Force India, not to mention their works team. Based in Brackley, Mercedes AMG Petronas (to give them their full title) took over from Ross Brawn’s ‘Brawn GP’, who’s single season in existence was the result of Brawn saving the team after Honda’s pulling out of the sport – talk about circles! The track itself matches it’s expectations. Whilst Singapore was a mental and physical toughness that punished any lapse in concentration, Suzuka punishes inconsistency. Imagine being a driver and trying to tackle this – with the exception of the home straight and the back straight, the steering wheel is constantly being turned, the car always being prepared for the next corner. Sweeping ‘S’ bends lead into the tricky double-right Degner turns, which tighten on the exit, before ducking under the bridge and into a hairpin left. Long right hand bends lead up to the Spoon curve, a multiple apex left-hander that gets it’s name because of how it looks from above, before you get the first respite on a straight that takes you over the bridge, into the flat out left-handed 130R, a right-left chicane before the final sweeping right leads back on to the start/finish straight. A figure of eight circuit with a clockwise first half and anti-clockwise latter half. Hardly time to catch breath. The flowing nature of the track means that if a mistake is made on one corner, it is punished for many corners afterwards, so precision in qualifying is extremely important. Practice sessions, as always, will be used to make sure the cars are set up properly. Downforce settings must be spot on; too much and the car will be too slow on the straights. Too little and the cars will sail into the gravel traps on the fast corners. 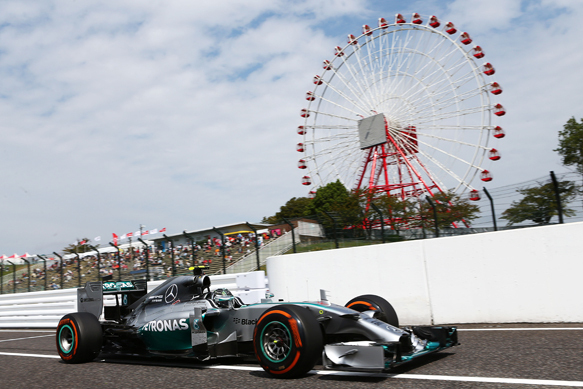 With all it’s turns, it isn’t brakes that suffer at Suzuka but tyres and gearboxes. Many changes are made through the middles of corners, each one must be precise to maximise speed. Overtaking is possible here though – into turns one and two, late braking into the hairpin and also at the chicane towards the end of the lap, although history has taught us that drivers must trust and respect each other for this to work without disaster. Romain Grosjean into Mark Webber in turns one/two, Sergio Perez and years before him, Gerhard Berger off at the hairpin and need I really mention the two Senna/Prost incidents? Weather can be a factor here, but it often remains dry. Typhoons can be a threat though, and there is a possibilty of one this weekend. Don’t hold your breath though, it is too early to tell at the moment. The last time that happened was on the Saturday of race weekend in 2004, when the FIA were forced to move qualifying to Sunday morning. Qualy and race on the same day? Wonder if we’ll see such an event again? Back to the present day however. Hamilton will start Sunday’s race as championship leader, almost unthinkable two races ago. Unquestionably he has the upper hand over Rosberg, but how long will that last? A ‘foreign substance’ was to blame for Nico’s nightmare in Singapore, which is something that is used pre-service at the factory. Surely it isn’t a foreign substance if Mercedes use it themselves? A little bit of positive PR for Rosberg’s sake I think. Psychologically, I explained before the last race that if Nico gets his chance to pass Lewis, he must take it cleanly and first time. I think we may see that this weekend at Suzuka; having recently been denied the excellent racing we had all seen earlier in the season. Any collision will be almost cliche, especially here. Thirty years down the line we’ll see replays of it every time F1 comes back to Japan. Aside from a slender lead, Hamilton’s other advantage over Rosberg is that he has won in Japan, in 2007. Although it wasn’t at Suzuka – the Japanese Grand Prix took place in Fuji that year. If anyone holds a ‘divine right’ to a podium at Suzuka, it’s current World Champion Sebastian Vettel. A winner in 2010, 2012 and 2013, second only to Jenson Button in 2011. Briefly resurgent at Marina Bay, where he led his first lap of this season before succumbing to Hamilton’s aggressive move, would this be the place he finally roars back into life? A championship charge is not too late, mathematically speaking, but a betting man would be wasting his money. Daniel Ricciardo is more in with a shout than his team mate, but will need more than a little bit of luck to be considered a true title contender by nightfall on Sunday. Fernando Alonso and Kimi Raikkonen are the only other drivers on the grid to have won in Japan. 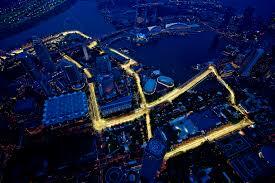 Alonso was on the tail of both of the Red Bulls in Singapore, but this is an entirely different type of circuit. As previously mentioned, Mclaren will be part of the PR machine that Honda will be running this weekend, so any positive result here will be met with some confusion, bittersweet almost. Williams’ drivers have run each other close lately, although disregarding any Mercedes based disaster, I don’t see them reliving their winning days here, having won 3 times at Suzuka in the 1990’s. Force India are holding onto a slender lead over Mclaren in the constructors’ championship, and I strongly believe that battle will continue way past this race up to the end of the season. I said in the last preview that Jean-Eric Vergne would be racing for his career. Well he certainly did himself no harm in that banzai style last few laps to take, and then hold on to sixth place, all with a 5-second penalty hanging over his head. His team however, have decided that young Max Verstappen will take part in FP1 to prepare him for his seat in 2015. Bernie Ecclestone has done his best (or worst) to drum up interest in F1 in the last couple of weeks, by suggesting that a number of teams, somewhere between one and four, won’t be on the grid next year. The four struggling teams are the four that make up the back of the pack at the moment. I would have to say that I feel Marussia are the safest of these four. They’ve scored their first points this season and look to be leaving Caterham in their wake, at last. Sauber are having their worst season ever and team boss Monisha Kaltenborn has come out to say that Sauber will be on the grid in 2015; although in F1 statements can mean very little. Lotus’ owners have suggested re-structuring their financing of the team, but again I don’t think this means they won’t be around in 2015. The most likely to vanish, if any, are Caterham. Christian Albers, who only joined the team’s management after Tony Fernandes sold the team in July, has already left because he realised the debts cannot easily be paid. Tyres were going to be withheld from the team unless they paid Pirelli, they effectively sold Kobayashi’s seat in Spa to Andre Lotterer. All bad signs. All teams have moved this week to rid speculation surrounding their future, but little will quell the rumours unless performances vastly improve. Gene Haas will have his American team ready for 2015, but how competitive they will be remains to be seen. Good results are all that matters for everyone at Suzuka; yet the term means something entirely different to the two ends of the grid. If you’re like me and will be getting up early this weekend, rather than throwing an all-nighter, then you can just mark off the various things to look out for rather than drinking. But should Japan’s sole contributor Kamui Kobayashi have anything to celebrate, you can bet that some all-nighters will be thrown in and around Suzuka.